I distinctly remember the first time I saw a Danger Zone in the wild: its wild blitzing flash pattern caught my eye from several blocks away, promoting me to bike like mad to catch its owner and ask them what light it was. This light implements two 0.5 watt LEDs next to each other, giving it a unique design. The DZ has two flashing modes: a slow, steady pulse which alternates between the left, right, and both LEDs; and a rapid blitz which quickly alternates between the two lights for a few moments, then pulses each LED once. The first mode is much easier on the eyes if biking with other people, but when in crazy traffic or on a road without bike lanes, the blitz mode is wonderfully attention-grabbing. The individual half-watt LEDs on the DZ aren’t quite as bright as the Radbot’s 1W and some other 1W lights such as the Mars 4.0 and the Planet Bike Super Flash Turbo, but the effect of having two lights helps make up for it. The individual LEDs also seem to be brighter than the 0.5 W LED in the older PB Blinky Super Flash, which may simply be a result of LED technology improving over the years. Either way, this light is plenty bright, and likely to get you seen. What I would like to see is a dual-1W version of the Danger Zone, and a flash option to fire both LEDs at once. Despite some of the shortfalls of the DZ’s design (explained below), I would buy one of those in an instant for the sheer epic brightness. Despite its greater price tag ($37 MSRP, although my LBS was selling it for $30), the Danger Zone lacks some of the nice features of the Radbot. It doesn’t come with a rack mount (although it is compatible with the Radbot and Planet Bike’s mounts, both of which can be purchased separately). I also don’t prefer its button, and wish PDW would implement the Radbot’s switch style here – the DZ doesn’t remember its mode, and must be cycled through each time you turn it on. There’s also no time-delay, which makes it slightly more prone to accidentally activating in your pack, although the switch is large and clicky enough that it’s still easy to use with gloves, and doesn’t activate easily like the PB Blinky 5. Perhaps the biggest downside of the Danger Zone is replacing the batteries. The first time I did it, I was afraid I was going to break the darned thing. On the upside, there’s a pretty good seal for the battery chamber, but prying the light apart is difficult, and putting it back together is even worse. You can’t quite pop the cover right back on – you sort of have to slide it in, then press down hard and hope you don’t break any plastic. If PDW ever makes a Danger Zone 2.0, they should make replacing the battery much easier. I would vastly prefer using a screwdriver to fearing that I’ll break the light every time it runs low on batteries. Overall, I really like the Danger Zone, and will keep using it. It’s bright, attention-grabbing, and I really like its form factor. However, given its rather steep price and the sketchy battery replacement procedure, it’s not the best deal. 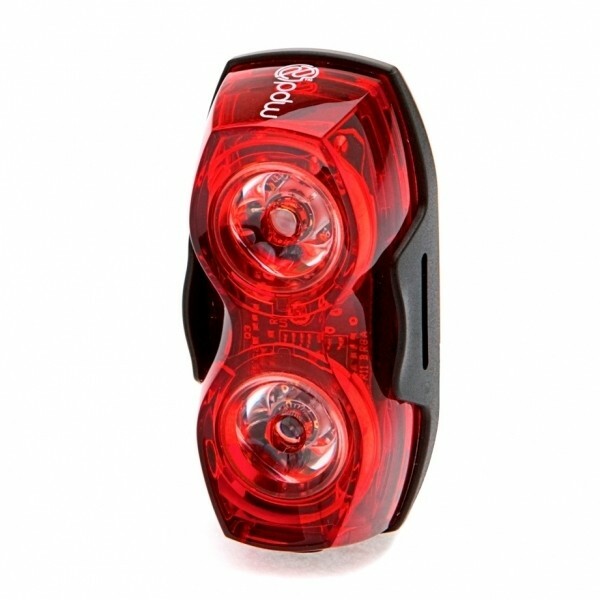 The Radbot gives you a brighter light in an easier to use package, with more attachments and a lower price tag.